Why the volleyball back row attack is so important for developing spiking strength and power. I believe the back row attack is a skill that should be developed by all attackers on the team. It doesn't matter if you are never going to be set a back row ball, you should practice hitting out of the back row. Especially if you only play across the front row, I believe it's absolutely critical to practice hitting out of the back row. Improve out of the back row and you'll surely improve your front row attack. Before getting into a discussion on why it's important to learn how to back row attack, let's first discuss fundamentals of hitting. When it comes to improving the spike, the volleyball approach is what gets the most attention. If you're having trouble hitting, the first thing the coach will usually do is critique your approach. It's true the approach is important. If you improve your approach then it will be easier to hit. However, the approach is just one piece to a successful attack. You don't want to overlook the importance of the ball contact. The purpose of the approach is to help you get in better position to hit. The arm swing and ball contact is most important part to a successful spike. Anticipation or reaction skills help an attacker get in position to hit. The better a player is at anticipating the play, the better the player will be at getting in position to make the play. You will often see players have very poor approach footwork and technique, and still be able to get in position to hit. These types of players are able to hit even though they have poor techniques because of how well they anticipate. Along with anticipation skills, speed, strength, and coordination are also important factors. Hitting the ball hard is what most coaches emphasize. Young players are often taught that to be a good hitter, you've got to hit the ball hard. Hitting the ball hard is important, but how you contact the ball is also really important. Hitting the ball hard is something that is over emphasized especially when players are first learning to play. Especially at a young age, most kids have trouble serving the ball over the net. The main focus becomes hitting the ball as hard as possible just get it over and in. Instead of focusing on hitting hard, have players do drills where the focus is on "ball control". For example, instead of hitting for a kill, have the hitters focus on hitting the ball "controlled". Focus more on "cooperative" drills in practice. If drills are cooperative instead of competitive, the rallies will last longer. This is why I think learning to hit the volleyball back row attack is so important. When hitting out of the back row, the contact with the ball is made more above the head, and less out in front of the body. Not all sets will be tight and a lot of times the ball is set further off than expected. 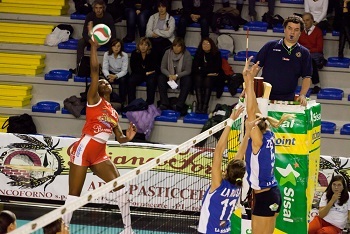 The technique of contacting the ball at this spot is a very important skill because often when attacking at the net, the hitter must reach back and hit. The mindset of Hitting Hard = Good Hit often becomes ingrained early on in a volleyball career. It's difficult to maintain the "just hit hard mentality" when hitting a back row attack because the further off the net, the more important it is to hit the ball with control. Basically, when hitting off the net, there's less room for error. If you want to improve your ball control, practice hitting off the net. The further you're off the net, the more you'll contact the ball above your head and not out in front. 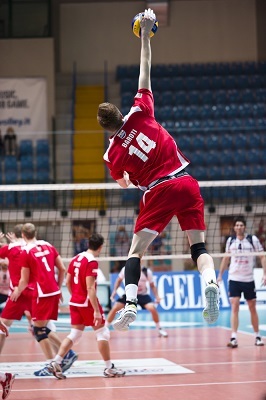 A good topspin jump server has developed the strength and coordination for contacting the ball in this position. Is strength and coordination an issue? It's easier to hit hard when you contact the ball more out in front. Most players, especially younger players, don't have the strength to hit the ball hard unless the ball is out in front. The following are some strength exercises to help increase hitting strength and power. This exercise can be done using a light weight, kettlebell, or band. This is not just a tricep exercise. Really focus on using the upper back and core muscles. Do this exercise for 2 or 3 minutes or until technique starts to break. This exercise is especially effective for beginner players that have trouble just serving the ball over the net. If you do this exercise before practice your serves and spikes will feel a lot stronger and powerful. Grab a partner or find a wall and do the overhead throwing motion using a medicine ball. First, start the movement slowly and focus on learning the technique. Once you get the technique down, practice throwing the ball more explosively. Medicine ball one hand overhead throws. Definitely go slow in the beginning and focus on perfect technique. This is a great shoulder warm up for volleyball. 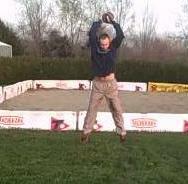 Medicine ball two hand overhead slam. Bring the ball up overhead and slam the ball into the ground with two hands. Your feet will actually leave the ground as you bring the ball up above your head. Medicine ball one hand overhead slam. When doing one hand slams, it's usually easier to use a baseball type throwing motion. This is where you bring the arm back down and around in a circular motion. This is also a good dynamic shoulder warm up exercise. Along with explosive upper body exercises like medicine ball throws, exercises such as medicine ball push ups are important for shoulder strength. 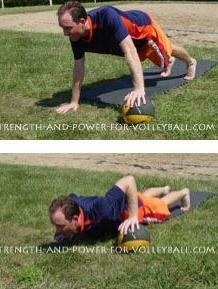 Medicine ball push ups work to stabilize the shoulder joint. Your volleyball strength program needs to include strength exercises that improve shoulder stability. Exercises like the medicine ball push ups force the shoulder stabilizer muscles to turn on. This strength is important for supporting the shoulder during spiking in volleyball. Dramatically improve your hitting power by focusing on exercises that work to stabilize the shoulder along with exercises that improve the dynamic flexibility and explosive power (medicine ball throws).